Join us throughout June & July as we’ve got some voices from our own house and some in our city to help us grow in our faith! We’ll raise the praise together every Sunday at 5pm, and remember: summer’s a great time to go out for dinner, coffee, or ice cream after service with some friends and meet some new ones! We pray that tonight would be encouraging for you. If you're a guest here with us, we invite you to fill out our communication card in our app or at the Next Steps table in the back of the auditorium after service. We'd love to meet you, and we have a free gift for you. 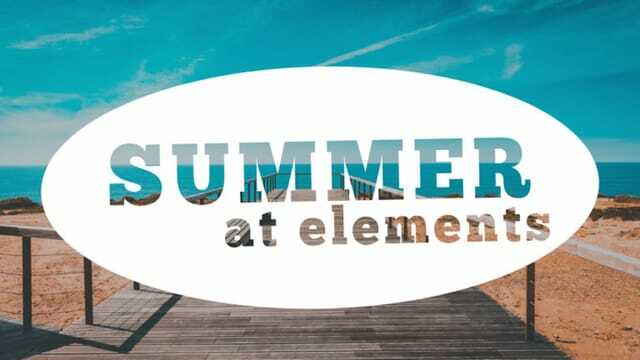 Click the link below to see THE WEEKLY - our digital announcements/info for all things happening in and around Elements...or find everything you need in the Elements City Church app in the App Store and Google Play. If this was the observation of a pastor in the late 1950s, early 1960s how much more true is this today in the age of social media and up-to-the-second news we are used to seeing on our smartphones? We're always connected, but are we always connected to the heartbeat of God? When we say “God is holy,” what we are saying is “God is set apart,” or more simply, there is no one, and nothing, like our God. If the song of heaven is simply to sing “Holy, holy, holy” do you think it’s important? God cares about holiness. How are you pursuing holiness in your own life? When you’re in the presence of perfection, you can’t help but have a deep and uncomfortable awareness of your imperfections. Do you see who you really are in relation to a holy God? Can you see the areas in your life where you have unclean lips? What do you see in our culture that shows we have unclean lips? Every single one of us will stand before him with our imperfections, and you need to recognize this: God is moving toward you. And as He is moving toward you, it’s not to embarrass you, it’s not to shame you, it's not to chastise you. He’s moving toward you with a desire to cleanse you. To make you holy. Once we get a glimpse of our depravity in light of God’s holiness, we can then get a true understanding of the power of the gospel, and why it really is good news. As we fix our eyes on Jesus and live our lives in gratitude for what He did for us on the cross, we see that we’re able to pursue a life of holiness because we’re no longer motivated by a sense of duty or obligation; rather, we are motivated by the love and thanksgiving that resides in our hearts for a God who would plunge Himself down to the depths of hell so that we could ascend to the heights of Heaven if we put our faith in Jesus. 4. The holiness of God is meant to shine through us to draw others to Jesus. God cares about holiness. How are you pursuing holiness in your own life? Our prayer team and pastors are available following service to pray with you. Or you can text the word "prayer" to our phone number 520-300-9001 to submit your prayer request, or submit one via our app. We look forward to partnering with you in prayer. Every gift you give enables us to move the mission of Elements and the Hope and Light of Jesus forward in our city and beyond. Thank you for financially and faithfully partnering with us! You can give here or easily within our app on your phone or tablet.